Please contact the Club Secretary for a membership form. All new and renewal memberships MUST have a completed membership form to join/re-join. All household memberships should complete a separate form for each person joining within the household. Any renewals whose medical or emergency details have NOT changed since 2018/19 only require to complete the data protection section and sign off the no changes section. For the fourth year running, there is no increase in the membership cost. Payment is preferred in cash or cheque. Cheques should be made payable to “Dunoon Hill Runners”. Bank transfer is also possible and details are on the form. All payments should be made on or before 23 February 2019 (AGM). Any payments not made by the end of February will have a reminder provided. If within 2 weeks of end February no payment is received, a non-renewal will be assumed and persons will be removed from the closed Facebook page and membership. 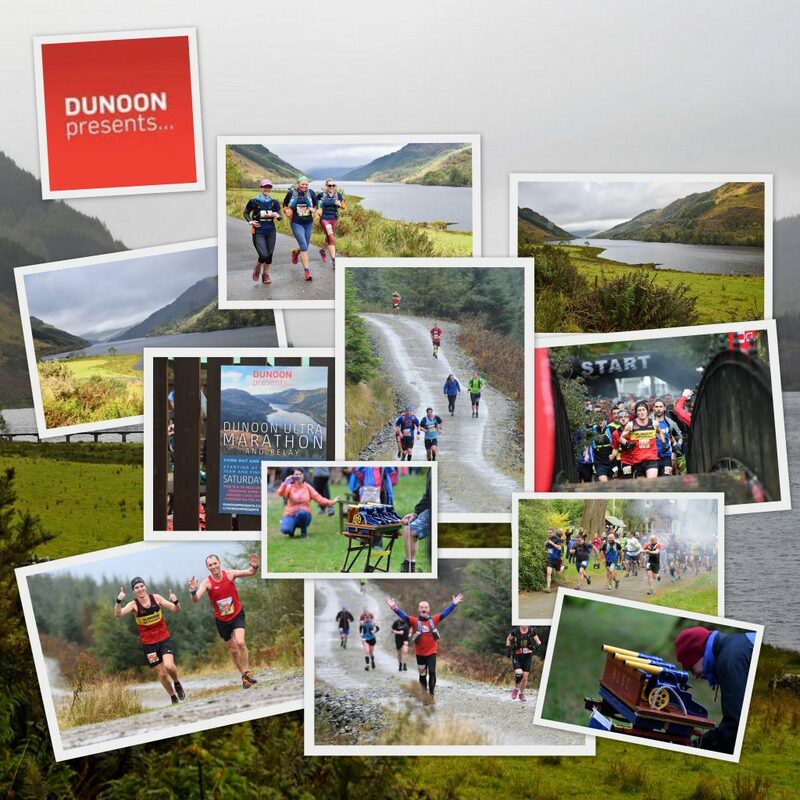 Entries for the Dunoon 55K Ultramarathon and Relay 2019 are open, presented by Dunoon Presents, and proudly supported by Dunoon Hill Runners. This year’s event will be held on Saturday 5 October 2019. Get your entry in here, while spaces last! Entries close on 28 February 2019. 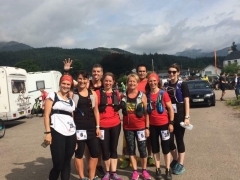 Finish off the year right and get a head start on New Year’s resolutions by coming out for a Breakfast Run on Monday 31 December 2018 at 10 am at the Whistlefield Inn by Loch Eck. 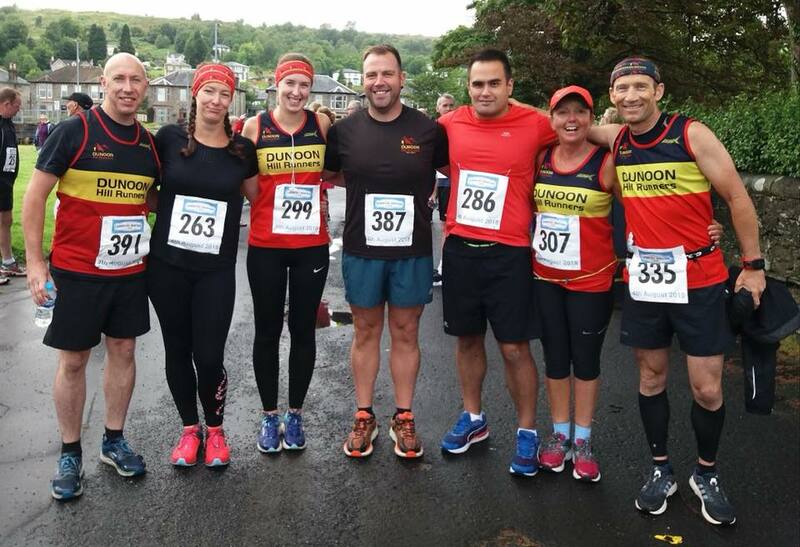 Dunoon Hill Runners are hosting a social run which is open to non-members. So bring the family, friends and dogs for a run on a short or longer route. There is also a lovely one mile loop that can be walked with children. A festive warm drink will be provided by the Whistlefield Inn. Anyone wanting to stay for lunch should contact the Whistlefield to book a table. Runners should meet at the Whistlefield Inn car park at 10 am. 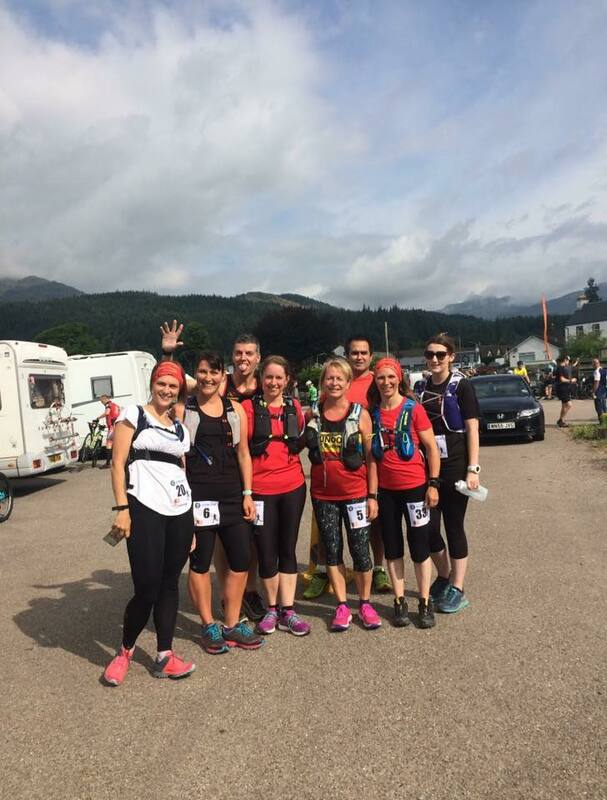 Dunoon Hill Runners will be starting a new beginners training group from 6 November, for 8 weeks. Sessions will take place each Tuesday evening from 6.30 pm to 7.30 pm. There will be a maximum of 20 places and no waiting list. Each runner will require trail running shoes and a head torch (120 lumens and up are suitable). The cost will be £10 for the 8 week training period and a temporary membership form must be completed before attending. All data is confidential and will not be shared with any other party. If interested, please contact the club here, and submit your form no later than 23 October 2018. Forms can be handed in to Lisa Marshall at HELP, John St, Dunoon. Once 20 forms have been received, the group will become closed. It’s been a highly productive summer for Dunoon Hill Runners, with club members pursuing a broad range of distance and personal fitness goals. 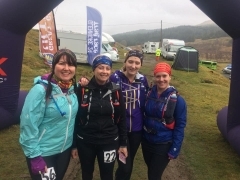 The club has been represented in races ranging from 10K to almost 100 miles in length, mostly on hilly trail but with an occasional foray on to tarmac. 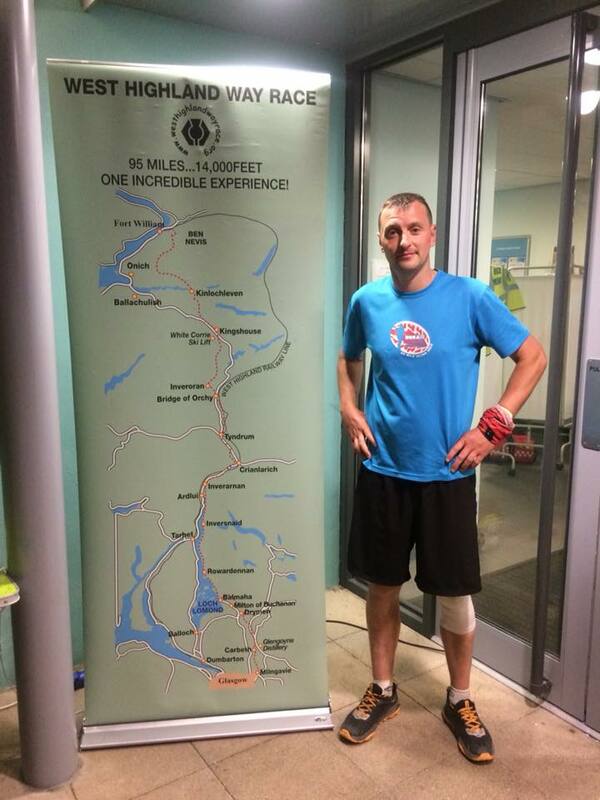 The longest distance, at 96 miles, was the West Highland Way Race. This was David Wilson’s third outing and saw him take almost 3 hours off of his 2017 time, coming in at 22 hours, 55 minutes. Ricky Reid took an almost identical time off of his previous year’s time, coming in at 23 hours and 21 minutes this year. 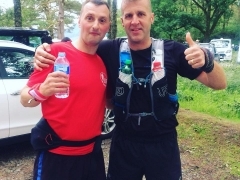 Ricky went on to earn the title of “Triple Crown” winner, after having run all 3 major races on the West Highland Way in 2018, including the 53 mile Highland Fling and the 42 mile Devil O’ The Highlands. Dunoon Hill Runners could be found in numbers at races across the country such as the Goatfell Hill Race, the Glen Lyon Ultra, the Cowal Way Chase, the Fort William Marathon, the Devil O’ The Highlands , the Lakes Sky Ultra, the Dunoon Presents Half Marathon and 10K, the Calderglen 10K and the Bute Highland Games 10K. The 2017 President’s Trophy winner, Bryan Fitzpatrick, has kept busy, competing in over a dozen Scottish Hill Racing series events as well as club races so far this year – too many to list! 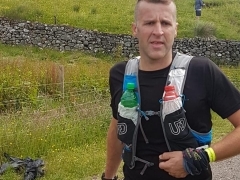 The second year of the Cowal Way Chase produced a second place for Roger Stewart in the 18 mile trail race, plus a first female place for Marion Mcmillan and third overall for Ricky Reid in the 30 mile ultra race. 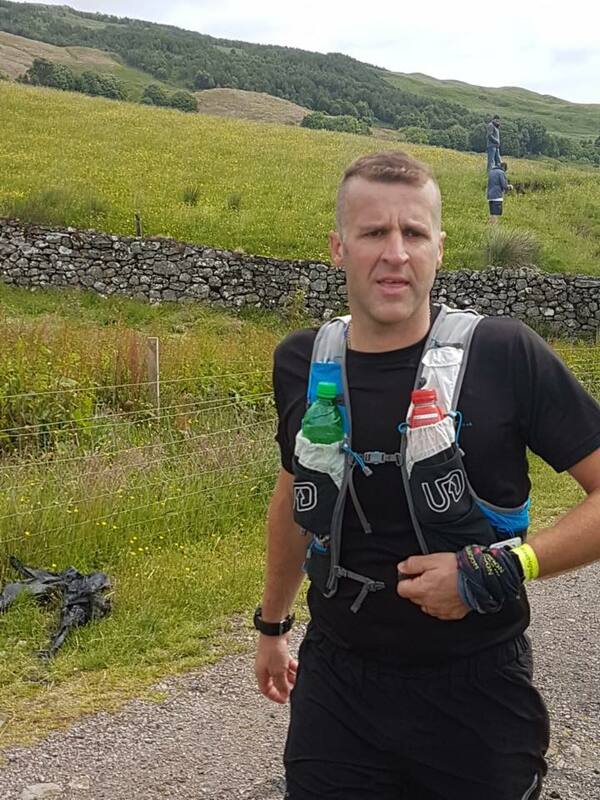 Elsewhere, new member Stuart Greenway snagged first place at the Dunoon Presents 10K while Ross Morley-Trapnell was first in the MV50 category. 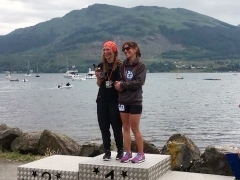 It’s been a great season for Jean Mclennan who came fourth in her FV50 category in the Highland Fling among other accomplishments. 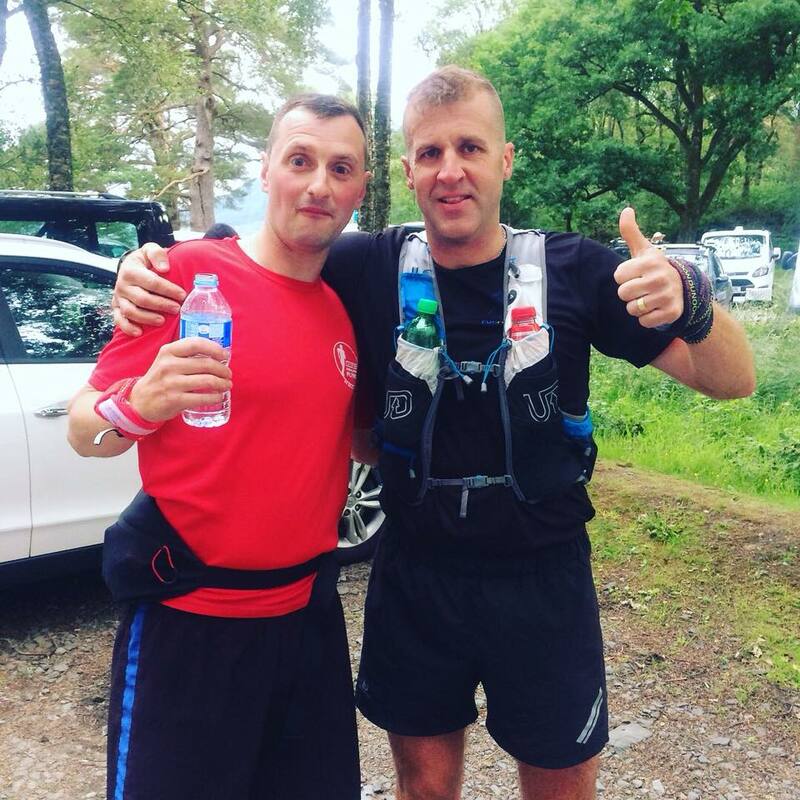 And returning to the Devil O’ The Highlands, Grant Mackellar finished in an impressive twelfth place overall. 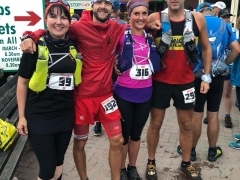 Kat Sims ran the Lakes Sky Ultra in the Lake District, a race described as “extreme mountain racing”, where she was the fifth female finisher. 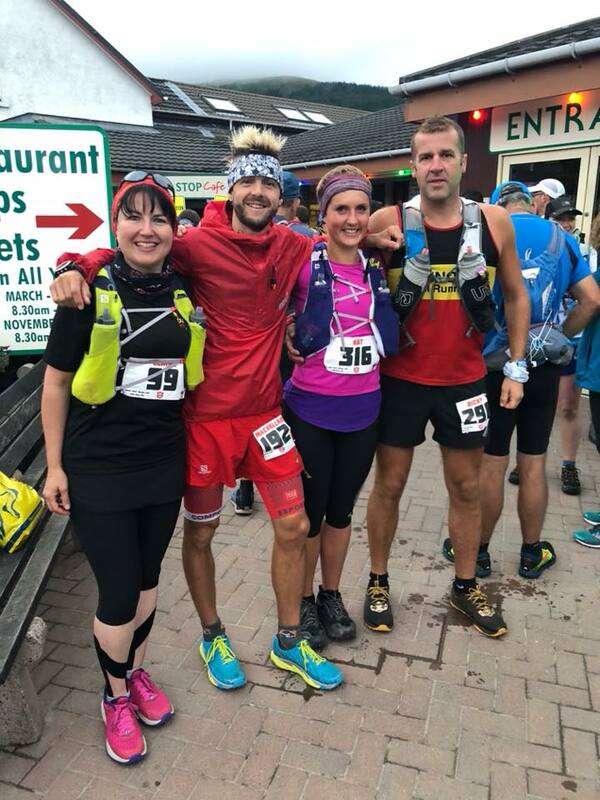 No stranger to distance running, Morven Walsh had set herself her most ambitious challenge yet by taking on the 73 mile Great Glen Way Ultra in July. The route follows the major natural faultline from Fort William to Inverness and starts at 1 am on a Saturday morning. Runners have 22 hours to complete the race with no support crew allowed. Morven finished comfortably in 19 hours and 41 minutes. Wrapping up the summer, the club, including several beginners, was out in force at the Cowal Highland Gathering competing in both the road and the hill races. 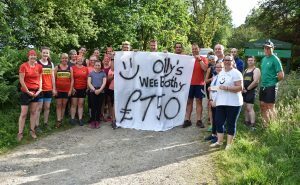 Of course, it’s not all about huge distances and podium places as there have been many other personal achievements, including Ciorsdan Taylor’s first Dunoon Half Marathon, where she raised over £500 for Olly’s Wee Bothy. 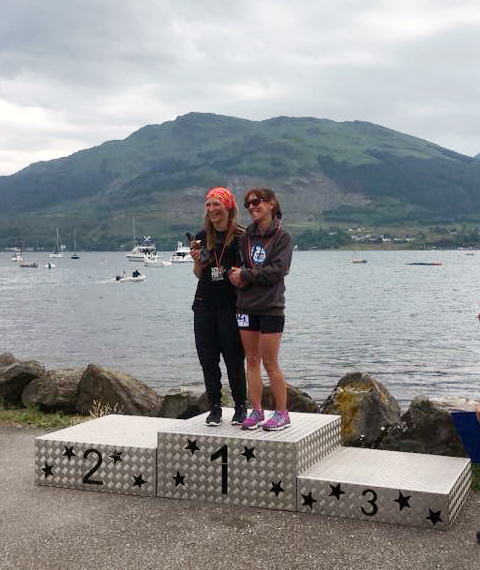 Whilst several members have used their club training to assist with fitness for other disciplines such as triathlon, Eilidh Brown attributes her DHR training with enabling her to obtain 10 international refereeing caps at the European Touch Rugby Championships. For others, still being able to fit into their running vest was noted as being the height of attainment. Swapping their usual activities for something more sedentary, Dunoon Hill Runners recently held a charity quiz night to raise funds for two charities previously chosen by a vote of its members: Olly’s Wee Bothy and the Cowal Community Palliative Care team. The combined brains of the 8 teams in attendance engaged in a hard-fought battle which tested on specialist subjects as well as general knowledge. In addition, a raffle containing lots of excellent prizes donated by local businesses contributed to the proceeds. The evening resulted in a very impressive £1,140 being raised, which was subsequently rounded up to £1,500 by a donation from club funds. This amount was then split and cheques for £750 each were presented to the two charities. 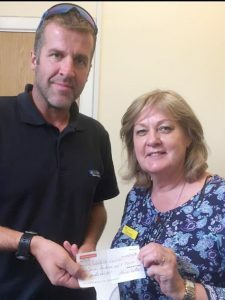 Dunoon Hill Runners wishes to thank all the members and guests who contributed to these worthwhile causes, Dunoon Lodge 335 for the use of their hall on the night, as well as the many local businesses who kindly donated raffle prizes. 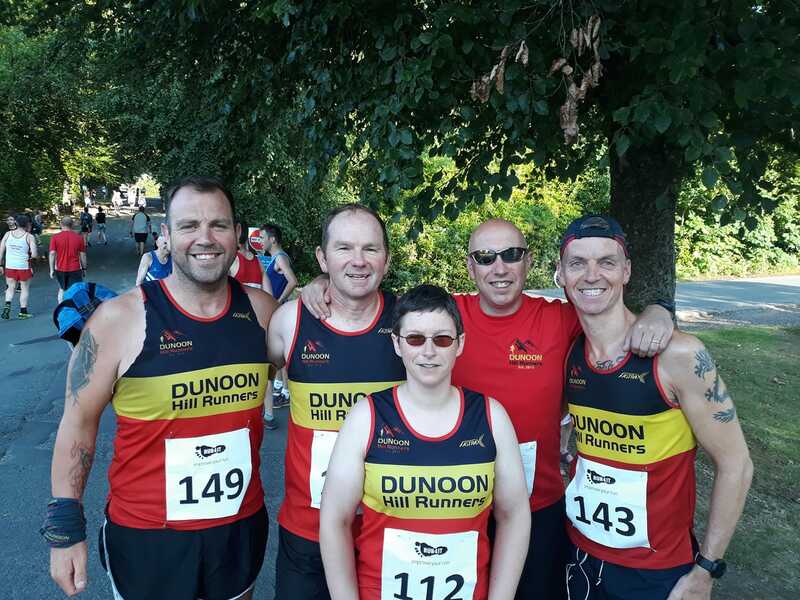 Dunoon Hill Runners will be kicking off its 2018 Summer Series with a 10K trail race at Glenkin forestry on 31 March 2018. This will be followed by a Kids’ Fun Run, an Easter Egg Hunt and a barbecue. All members and their kids are welcome. Please let us know if you plan to attend. 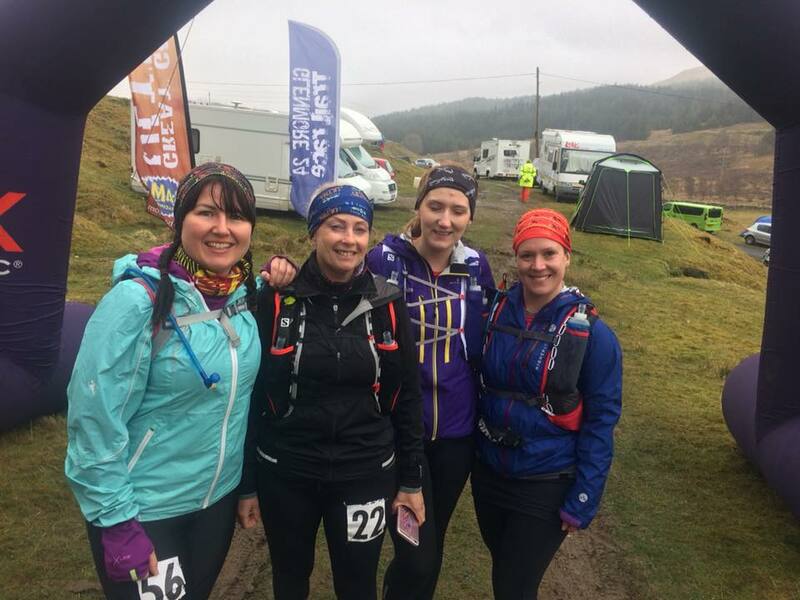 You would think that a few feet of snow, courtesy of the “Beast from the East”, might put folks off venturing on to the Cowal hills this past weekend, but not so for the Dunoon Hill Runners. In fact, if numbers were anything to go by, the snow would seem to have attracted club members on to the summits and trails of the area. Through the weekend, runners teamed up to enjoy the scenic winter conditions, and an impressive total of over 350 miles was tramped out on the snowy pathways. 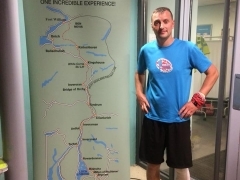 Run routes of distances varying between 2 and 24 miles covered the length and breadth of the peninsula, including Glenkin, Bishops Glen, Heronlea, Ardnadam, Strone Hill, Loch Striven, Toward, Benmore and Bishop’s Seat. A club Breakfast Run had previously been scheduled for Saturday 3 March, and was one of the few sporting events in Scotland that was not cancelled. A group of about 25 members and some of their children took to the trails around Hunters Quay Holiday Village before finishing up with a vigorous snowball fight and a hot drink and cake. It certainly proved that, despite the unseasonal weather, running on the hills isn’t so beastly! 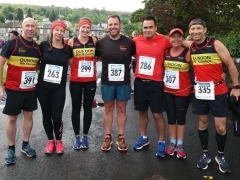 As has become traditional, the day of the Dunoon Hill Runners annual AGM and Prizegiving, held on 24 February 2018, commenced that morning with the last club league race of the year. This was the Handicap Race, a 4K loop in Glenkin. 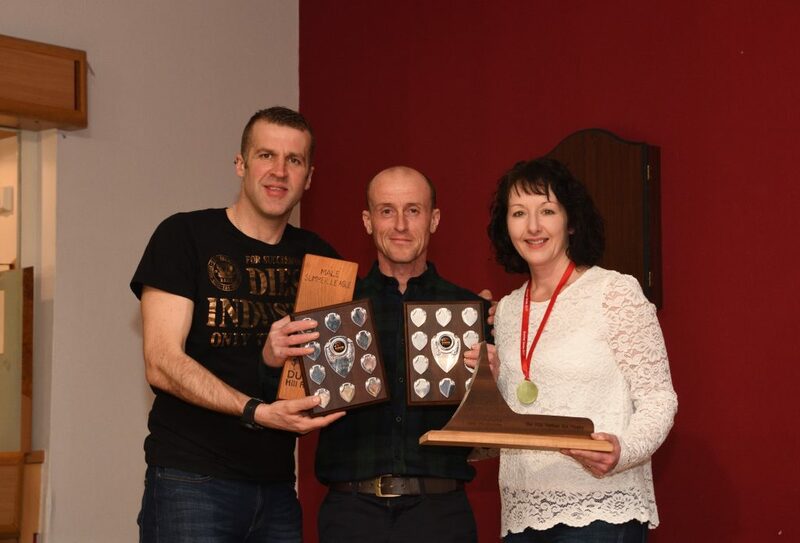 Start times were allocated to runners based on their season’s performance, and first across the finish line this year were Ann Keenan and new member Steve Danby. 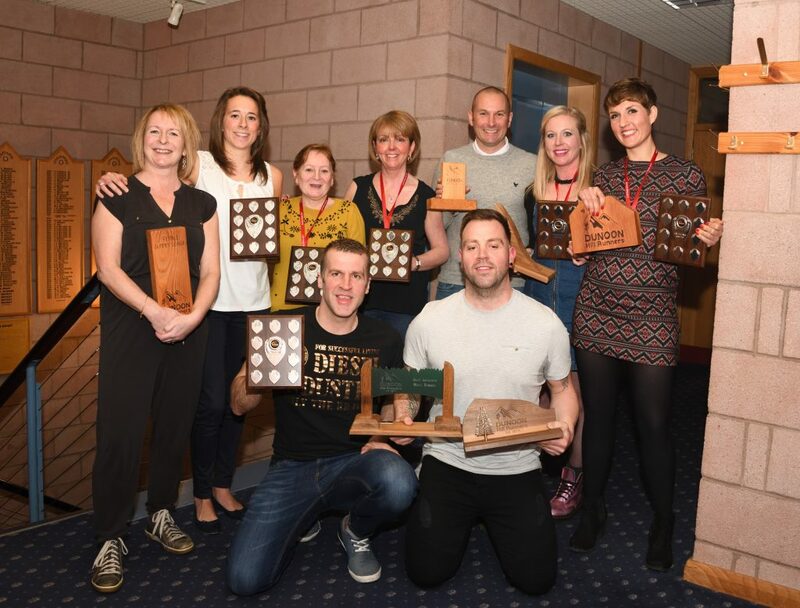 The evening’s proceedings were held at Cowal Golf Club, starting with the AGM when Club Chairman, Ian Marshall, reviewed a year that had seen a sizeable intake of new runners, expanding the membership total to over 100. In acknowledgement of this, attendees voted in an additional 6 committee members, with positions covering social events, training co-ordination and membership. The club prizegiving ensued and included the presentation of a new trophy which had been designed and hand made by Holly Lyons of Dunoon Grammar School. Medals were also presented to all members who had participated in the club league.